Mankind has studied the universe for thousands of years by looking at the fascinating night sky, guided by the visible light emitted from myriads of stars and other phenomena. During the last century new pictures of the night sky have been discovered by scientists using different wavelengths of light which the naked eye cannot see, such as radio waves, infrared light, x-rays and gamma rays. Each time new windows in the sky are opened, new unexpected phenomena have been discovered, like the microwave background from Big Bang, neutron stars, active galactic nuclei (AGN), black holes, gamma ray bursts (GRB) and other exciting objects. Today, scientists are starting to open up a completely new window by using another elementary particle, the neutrino, instead of the photon, which is the elementary particle of light used to investigate the universe. This new field called neutrino astronomy, will hopefully reveal new unknown phenomena and help us answer several of the questions we have today. The neutrino is an elementary particle, which was postulated in 1930 by Wolfgang Pauli, 1945 Nobel Laureate in Physics, in order to solve an energy crisis in nuclear physics. Scientists had difficulty finding energy in radioactive decays and Pauli suggested the existence of a particle which he believed was carrying away the missing energy. But it took some years before the neutrino was discovered. It was Clyde Cowan and Frederick Reines who first detected and identified this particle in 1965. For his contribution, Reines was awarded the 1995 Nobel Prize in Physics. The neutrino is an obscure particle with no electric charge and which only interacts with matter via the weak nuclear force. In recent years it has been discovered that neutrinos have a small mass, debunking the earlier assumption that it was massless. In the sun, an enormous number of neutrinos are produced in the fusion process when four hydrogen atoms transform into one helium atom. Despite the large number of neutrinos, an average of only about one of these will interact with a person’s body during a lifetime. The flux of neutrinos from the sun at the surface of the earth is 6×1010 neutrinos per square centimeter and second. The neutrinos from the fusion process in the sun can pass through several light years of solid lead before being absorbed by matter. The probability for a neutrino to interact with matter increases, however, with the energy of the neutrino. Three different kinds of neutrinos have been observed: the electron neutrino , the muon neutrino and the tau neutrino . These neutrinos are related with three electrically charged particles, the electron, the muon and the tau. All six particles are called leptons. When a neutrino interacts with matter, it can either continue as a neutrino after the interaction (“neutral current interaction”) or create the corresponding charged particle (“charge current interaction”). The electron neutrino creates an electron, the muon neutrino a muon, and the tau neutrino a tau lepton. A muon neutrino interacting with an atom producing a muon and a shower of short-lived particles. During a high energy neutrino interaction the charged lepton will continue in almost the same direction as the incoming neutrino. In matter, an electron that is produced during interaction will be stopped by a few meters whilst a muon, with its larger mass, might continue for several kilometers depending on its energy. Determining the direction of the created muon will give the direction of the muon neutrino within a few degrees. This is the key to understanding high energy neutrino astronomy. Neutrinos can be divided into two categories, low energy and high energy. This is, of course, a quite arbitrary division but it reflects the production processes and the way in which detectors are built. The low energy neutrinos are mainly produced in nuclear processes, like the fusion reactions in the sun or in the center of an exploding Supernova. The high energy neutrinos are mainly produced in high energy particle collisions producing short lived mesons, decaying to neutrinos and other particles. In a particle physics scale the low energy neutrinos have energies in the 10th of MeV (Mega electron Volts), whilst the high energy neutrinos have energies above 10th of GeV (Giga electron Volts). So far, only two sources of extraterrestrial neutrinos have been observed. Both are low energy neutrino sources. The first source is the sun from which Raymond Davis Jr., 2002 Nobel Laureate in Physics, managed to catch an average of half an electron neutrino interaction per day in his detector during 20 years. The second source of extraterrestrial neutrinos was observed during 10 seconds in 1987 when a star in the Large Magellanic Cloud exploded as a supernova, which was later named SN1987. The neutrinos from the inner part of the collapse reached the earth after a journey of 170,000 years, a few hours before the arrival of light. The neutrinos were able to travel more or less directly from the central collapse in the inner part of the star, but the effect of the explosion was not visible at the star surface until later. About 25 neutrino interactions were observed by the detectors at Kamiokande (Japan), Baksan (Sovjet union) and IMB (USA) during 10 seconds. This observation of neutrinos from the sun and the supernova represented a new kind of astronomy since the neutrinos give us information from processes deep inside objects hidden from visible light or photons in general. 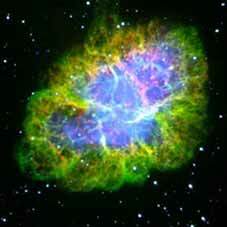 The crab nebula is the remnant from a supernova explosion 1054. In the enormous explosion 99% of the energy was released in invisible neutrinos. A strong argument for the existence of high energy neutrinos from the cosmos is the observation of high energy cosmic rays. Nuclear particles, which have propagated through deep space for many millions of years, are continuously bombarding the atmosphere of the earth. When colliding with the earth’s atmosphere the particles create showers with many short-lived particles. At the surface of the earth we observe the remnants of the showers in the form of about 100 muons per square meters and second. Very large surface detectors are today measuring the intensity and the energies of the cosmic rays. Despite the discovery of the cosmic rays as early as 1912 by Victor Hess, 1936 Nobel Laureate in Physics, we still do not know where they come from. We expect that most of the particles are created in supernova explosions in our local galaxy but the cosmic ray particles that have the highest observed energies are assumed to come from unknown sources outside our galaxy. The highest observed cosmic rays have energies of 50 joules. The acceleration process giving the particles these extreme high energies is not known. Neither are the sources of these particles. The energy of the highest cosmic ray particles is ten million times higher than what the world’s most powerful particle accelerator LHC (Large Hadron Collider) will be able to reach when it starts in 2007 at CERN, Geneva. If one would “build” an accelerator for protons with the same energy as the highest cosmic rays based on the LHC superconducting magnets, the size of the accelerator should be larger than the earth’s trajectory around the sun (LHC has a circumference of 27 kilometers). Since the cosmic rays are electrically charged they will be deflected by the magnetic field in space. That means that the direction of the cosmic rays is not pointing back to the source. To detect the source one needs an electrically neutral particle like the neutrino that is not influenced by the magnetic field. The cosmic rays with more than 10% of the maximum observed energies will interact with the microwave background from the Big Bang and will not be able to travel long distances in the universe. The sources have to be “close,” not further away than 50 million light years, which is a very “short” distance in the cosmos. The existence of these extreme high energy cosmic rays is a real mystery. When the protons collide with the microwave background photons, mesons are created which in their decays will produce high energy neutrinos. These are called GZK-neutrinos (after Greisen, Zatseptin and Kuzmin) and are a guaranteed source of extraterrestrial high energy neutrinos. The photons have an even larger probability than protons to be absorbed by the microwave background photons, which implies that the universe is not transparent for very high energy photons. 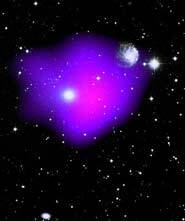 The Centaurus A shown in x-ray by the Chandra satellite. What is special with this object is the black hole in the center and the jet pointing towards the upper left corner in the picture. A possible source of high energy neutrinos? Copyright © NASA/SAO/R. Jraft et al. There are several possible candidates for the sources of the highest energy cosmic rays. 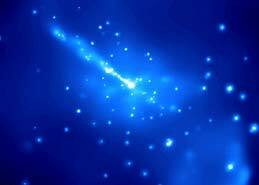 The active galaxy nuclei (AGN) is a galaxy that has a super heavy black hole in the center. The black hole can have a mass of up to a thousand million solar masses. From the center of these galaxies a jet structure is observed ranging tens of thousands of light years out, emitting large amounts of energy. The jet is produced when matter in the galaxy falls into the black hole. High energy photons have been observed from these objects and protons might be accelerated, too. Another possible source are the gamma ray bursts (GRB) which are strange events emitting a short pulse of gamma rays during a fraction of a second and up to 100 seconds. They are the most energetic events observed in the universe. About two of these events happen every day. They are very far away, with distances of up to 1010 light years. Possible explanations of these events are that of super heavy stars collapsing to black holes or two neutron stars falling into each other. The unknown sources of the high-energy cosmic rays will produce neutrinos when the accelerated high-energy protons collide with the photon gas around the sources, in the same way as with the microwave background. The collisions will produce mesons, which decay to muons and neutrinos and the muons will decay to electrons (positrons) and two neutrinos. These neutrinos will travel, unaffected by the magnetic field in space and if detected on earth, they will point back to the sources of the cosmic rays. The flux of cosmic neutrinos can be estimated from the observation of the rate of high energy cosmic rays and one will find that one needs detectors the size of cubic kilometers in order to catch the neutrinos! High energy neutrinos, though not as high as those mentioned in the previous section, might be produced in connection with another strange observation. One of the main mysteries in physics and astronomy today is the “dark matter” in the universe. Galaxies and groups of galaxies rotate as if they contain more matter than what we can observe with our standard astronomical instruments. With only the observed visible matter, the galaxies should eject stars and matter out in the empty space due to the fast rotation. But this is not happening, which indicates that there is more matter in the objects than what we can observe. It is only the gravitational force, which feels the unknown hidden matter. This matter is called the “dark matter.” About 30% of the energy in the universe is in matter and the rest is in the form of an unknown “dark energy,” which we will not be discussed in this article. Recent measurements by the WMAP satellite has shown that only 4% of the energy of the universe is made of ordinary matter in the form of atoms building up the stars and planets. The rest, 25% of the total energy, is a new yet unknown kind of matter. The galaxy cluster NGC 2300 with three galaxies and a gas cloud. In order to keep the system gravitationally stable about 20 times more mass than the observed one is needed. One popular explanation of the dark matter is that the large part of this different kind of matter consists of weakly interacting massive particles (WIMPs) that were created in the Big Bang at the same time as our ordinary matter. Today, these particles flow around us and build up the dominating part of the matter in our galaxies. When they pass through the sun and the earth they might become gravitationally trapped in the center of these objects. The dark matter particles in the centers of the earth and the sun will destroy or annihilate each other when two of them meet and produce ordinary matter with, among other particles, high energy neutrinos. The typical energy of these neutrinos is much higher than that of the electron neutrinos produced by the fusion process in the sun. By observing high energy neutrinos from the center of the earth and/or the sun one could get information about the dark matter. At the same time, this should be a very important discovery for particle physics. When the cosmic rays hit the atmosphere, short-lived particles are produced which decay to, among others, muons and muon neutrinos. The muons spray the surface of the earth and are absorbed a few tens of kilometers into the earth. The neutrinos, however, can easily pass through the entire earth and they correspond to a neutrino background for cosmic neutrinos. At the same time, they can be used for testing the neutrino telescopes. Since the cosmic neutrinos are expected to have, on average, higher energies than the atmospheric neutrinos, this background can be handled. To detect high energy neutrinos from the cosmos, one is forced to compensate the extremely small chance that the neutrinos will interact with matter. The only way to do that is to use a very large amount of matter in the detection. The more matter used (in the detector) the more neutrinos will interact. Since the cost of a detector has to be limited, one chooses matter existing in nature, like water and ice, as detector material. One equips the detector volumes with light sensors placed in large geometrical patterns and uses the fact that charged particles moving faster than the speed of light in the matter emits Cherenkov light (named after the work of Pavel A. Cherenkov, Il’ ja M. Frank and Igor Y. Tamm, 1958 Nobel Laureates in Physics) in a cone around the moving particles. Since the neutrinos are electrically neutral they will not emit Cherenkov light, but the charged particles produced by the interaction will emit light. The material chosen for the detector medium has to be very transparent for light. The light sensors in the detector volume will observe the arrival time and the intensity of the emitted Cherenkov light from the muon. Using this information, it is possible to determine the direction of the neutrino within a few degrees. A problem with this kind of telescopes is that the flux of muons from the cosmic ray interactions in the sky above the telescopes is by far larger than the expected amount of muons from neutrino interactions. In order to reduce this background, the telescopes are placed deep in water or ice sheet, with the detector elements looking down through the earth. The earth is used as a filter absorbing the atmospheric muons. Only muons coming up through the earth are accepted as muons from neutrino interactions below the telescopes. The demands of large volumes of very transparent medium and low rate of atmospheric muon flux leads to the fact that the neutrino telescopes can be built only in very special places; deep in lakes or oceans, as deep as 4,000 meters or deep in the gigantic ice sheet in Antarctica. There are two high energy neutrino telescopes taking data today – the Baikal detector in Lake Baikal and Antarctic Muon and Neutrino Detector Array (AMANDA), the largest neutrino telescope located at the South Pole. 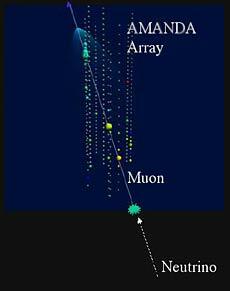 A muon from a neutrino interaction in the AMANDA neutrino telescope at the South Pole. AMANDA consists of 677 light detectors deployed in 19 holes deep in the ice sheet at the Amundsen-Scott base at the South Pole. The reasons for choosing this very strange place are the three kilometers thick ice sheet with the most optical transparent ice on earth and the USA base Amundsen-Scott, which is manned around the year. The light detectors have been deployed by melting holes in the ice, 60 centimeters in diameter and more than 2,000 meters deep. When the water filled hole was ready the drill was removed and the light detectors deployed before the water refreezed (which took about a week). The effective size of the telescope is 400 meters in height and 200 meters in diameter. The AMANDA telescope detects 3-4 neutrinos per day, which is in agreement with the expected number of atmospheric neutrinos. By detecting atmospheric neutrinos, the Baikal and the AMANDA neutrino telescopes have proven that the technique of large Cherenkov detectors is mature and ready to be used to search for high energy neutrinos from the cosmos. AMANDA, the largest telescope running today, has a possibility to observe cosmic neutrinos the coming years but might not be large enough. 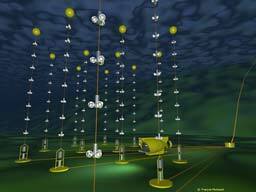 Several projects to build neutrino telescopes of the needed size are going on. The most advanced project is IceCube, which has started to be deployed at the same site as AMANDA at the South Pole. IceCube will consist of 80 strings of light detectors (in total 4,800) between 1,450 and 2,450 meters deep at the same site as AMANDA. The detector volume will be one cubic kilometer and the first string was successfully deployed in January, 2005. The deployment of the detector will take six years but data will be recorded together with the AMANDA telescope already from the first years. In the Mediterranean there are three projects, Astronomy with a Neutrino Telescope and Abyss Environmental Research (ANTARES) outside Toulon in France, Neutrino Extended Submarine Telescope with Oceanographic Research (NESTOR) outside Pylos in Greece and Neutrino Mediterranean Observatory (NEMO) outside Sicily in Italy. The ANTARES and NESTOR detectors are, with the first versions, aimed to reach the same size as the AMANDA telescope at the South Pole. One large neutrino telescope on the northern hemisphere would be a very nice complement to the one cubic kilometer neutrino telescope IceCube at the South Pole. The ANTARES neutrino telescope in the Mediterranean. There are other projects going on to detect high neutrino interactions in even larger detector volumes than one cubic kilometer. The main goal is to detect many of the GZK neutrinos that are produced when the highest energy cosmic rays are colliding with the microwave background from Big Bang. These detectors are recording the radio waves emitted in the neutrino interactions. The reason for using radio waves instead of optical Cherenkov light is that the radio waves can travel much longer in matter without being absorbed, allowing larger detector volumes. The neutrino energy threshold for this technique is, however, much higher than for the previous discussed telescopes, and they are mainly sensitive to the interactions of high energy electron neutrinos. The Radio Ice Cerenkov Experiment (RICE) project has investigated the technique of radio waves at the South Pole in the AMANDA site. 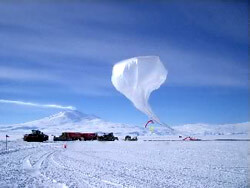 Another interesting project is Antarctic Impulse Transient Array (ANITA) that is a balloon experiment in Antarctica. The balloon with the ANITA radio receivers will circulate at 37 kilometers altitude in several turns (30 days) over the ice sheets and look for high energy neutrino interactions in the ice. The “detector volume” will be thousands of cubic kilometers. Looking for high energy neutrino interactions in the ice with the Antarctic Impulse Transient Array (ANITA) balloon experiment. An even larger detector volume is used in the GLUE project that is looking for radio waves from neutrino interactions in the lunar surface. Finally there are two satellite projects, Extreme Universe Space Observatory (EUSO) and Orbiting Wide-angle Light-collectors (OWL), which are proposed to look for neutrino interactions in the atmosphere with detector volumes of several 1,000 cubic kilometers. The hunt for high energy neutrinos from the cosmos has just started and, in the near future, we will hopefully learn new interesting facts about our fascinating universe. * Per Olof Hulth was born in 1943. He is professor in Experimental Astroparticle Physics at the Stockholm University, Stockholm. He obtained his Ph.D. in Elementary Particle Physics at the Stockholm University with a thesis about Strange Particle Production in Proton-Proton interactions. He started with Neutrino Physics when arriving as a fellow to CERN in 1976, working with the BEBC bubble chamber. He has been involved in the DELPHI experiment at the LEP-collider at CERN searching for the Higgs particle. After CERN he shifted to Experimental Astroparticle physics to search for neutrinos from cosmos and became the Swedish team leader in the AMANDA neutrino experiment at the South Pole. He was the first spokesperson for the new large Neutrino Telescope project IceCube (2001-2005) at the South Pole. He is a member of the Royal Swedish Academy of Sciences since April 2004.